Noah was the grandson of Methuselah, the oldest man in the Bible, and father of Ham, Shem, and Japheth. We don’t know when Noah lived, but estimates range from 5,500 BC to 2,300 BC, putting him squarely in the Neolithic Period—the last part of the Stone Age. Noah is remembered for having built an ark in preparation for a Great Flood that destroyed the world, with only Noah, his family, and a boatload of animals being saved. The Nuremberg Chronicle, one of the first printed books to successfully integrate illustrations and text, was published in Latin fewer than fifty years after Gutenberg invented movable type. Here Noah and his family and some helpers build the ark. But Noah was different. He was a good man, a man of integrity. 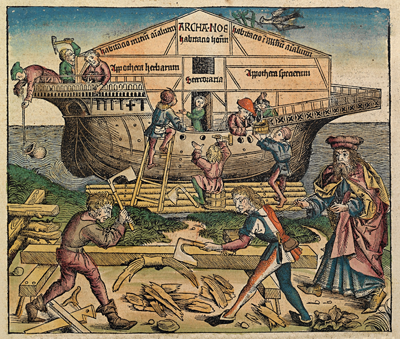 God told Noah that He was going to destroy every living thing on earth with a flood, but Noah should build an ark out of gopher wood and cover it inside and out with pitch. God told Noah how big to make the ark, and to make it with three decks and rooms inside and an opening at the top and a door in the side. Once Noah finished building the ark, God said, he should take into it his wife, his three sons and their wives, and a male and female of every kind of “unclean” air-breathing land animal. He should also take seven pairs of ritually “clean” animals and birds. And he should take enough food for the people and the animals. The Bible does not record any words spoken by Noah before the Flood. However, the Quran, which tells essentially the same story, says Noah preached to anyone who would listen, warning them of the coming flood: "O my people! Worship God! You have no other god but Him. I fear for you the punishment of a dreadful day!" Jewish legend says that for 120 years Noah urged people to change their wicked ways. Evidently no one listened to him. The floodwaters rose until “all the high mountains under the whole heaven were covered” and everything not on the ark died: “Birds, farm animals, wild animals, the entire teeming exuberance of life—dead. And all people—dead.” The floodwaters covered the earth for about five months. As the water began to go down, the ark came to rest “on the mountains of Ararat.” Noah opened a window and sent out a raven, which flew around looking for land. Noah then sent out a dove, which could not find a place to land either and came back to the safety of the ark. A week later Noah again sent out a dove, which this time came back with an olive leaf in its beak, indicating the water was subsiding. After another week, Noah sent out the dove once more, and this time it didn’t come back. One year and ten days after the flood unleashed its fury on the earth, God told Noah to leave the ark with all the animals. The sign of God’s promise was the rainbow. Every time there is a rainbow, God said, He would remember His covenant with humans and every living thing, and never again would floodwaters destroy all life on earth. lavish life on the earth, live bountifully! Traditionally, it was thought that everyone on earth was descended from Noah’s three sons. “From these the whole earth was populated,” the Bible says. Ham was said to be the father of southern people—Africans and the Canaanites. Shem was said to be the father of the middle people—Jews and Arabs; the term “Semitic” is still used today. Japheth was said to be the father of northern people—European or Caucasian people. Scholars have attributed Asian people to each of Noah’s three sons. Noah lived for 350 years after the flood, dying at the ripe old age of 950. He died well after the birth of Abraham, although the two most likely did not meet. The story of Noah and the ark is found in Genesis, the first book in both the Hebrew Bible and the Christian Old Testament, chapters 6 through 9. It is also found in the Quran.